Posts relating to buying and selling on eBay, working at eBay, or other eBay related issues. There have been so many articles posted on Steve Jobs in the past week, I really thought I wasn’t going to add one here on my blog. However, yesterday, John Lilly wrote a great piece on Steve Jobs yesterday, and I realized I might have a story worth telling after all. I find myself fortunate, in retrospect, to have joined Apple in 1996 as an intern, and then full time in 1997 just weeks before Steve Jobs took the helm as interim CEO. As an outgoing intern of the Advanced Technology Group, I actually did attend the meeting that John describes in his blog post. However, as a full time engineer on WebObjects, I also had the opportunity to attend a different all hands that Steve Jobs called for the entire Rhapsody team (the codename of the project that became Mac OS X). If you haven’t read John’s post, it’s definitely worth reading in tandem with this one. He does a great job capturing the insights from the ATG meeting. Instead, let me add to the story with my recollection of the Rhapsody meeting that happened the same week. The mood of the Rhapsody team meeting was energetic, but mixed. More than any other group at Apple, the Rhapsody team required a combination of talent from both long time Apple engineers and newly merged NeXT engineers. There was a palpable sense of excitement in the room, as particularly the NeXT team had a huge amount of respect for the “incoming administration”. At the same time, there was an element of discontent around suddenly finding themselves part of a large company, and even some skepticism that Apple was salvageable. Steve got on stage at the front of the room in Infinite Loop 4, and put a huge, larger than life picture of Michael Dell on the wall. He repeated the news fodder that Michael Dell had been asked recently what he would do if he was running Apple Computer. (At the time, Dell was the ultimate success story in the PC industry.) Dell said that he would liquidate the company and return the cash to shareholders. A few gasps, a few jeers and some general murmuring in the audience. But I don’t think they expected what he said next. And you know what? He’s right. The world doesn’t need another Dell or HP. It doesn’t need another manufacturer of plain, beige, boring PCs. If that’s all we’re going to do, then we should really pack up now. But we’re lucky, because Apple has a purpose. Unlike anyone in the industry, people want us to make products that they love. In fact, more than love. Our job is to make products that people lust for. That’s what Apple is meant to be. What’s BMW’s market share of the auto market? Does anyone know? Well, it’s less than 2%, but no one cares. Why? Because either you drive a BMW or you stare at the new one driving by. If we do our job, we’ll make products that people lust after, and no one will care about our market share. Apple is a start-up. Granted, it’s a startup with $6B in revenue, but that can and will go in an instant. If you are here for a cushy 9-to-5 job, then that’s OK, but you should go. We’re going to make sure everyone has stock options, and that they are oriented towards the long term. If you need a big salary and bonus, then that’s OK, but you should go. This isn’t going to be that place. There are plenty of companies like that in the Valley. This is going to be hard work, possibly the hardest you’ve ever done. But if we do it right, it’s going to be worth it. He then clicked through to a giant bullseye overlayed on Michael Dell’s face. I don’t care what Michael Dell thinks. If we do our job, he’ll be wrong. Let’s prove him wrong. All I can remember is thinking: “Wow. Now that’s how you regroup, refocus and set a company in motion.” I had seen speeches by Gil Amelio in 1996, and there was nothing comparable. Please remember, at this point in time it wasn’t at all obvious that Steve or Apple would actually succeed. But I felt like I’d witnessed a little piece of history. That meeting left a huge impression on me that extended well beyond Apple. Steve’s actions and words at Apple in 1997 represented the absolute best in leadership for a turnaround situation. It wasn’t until 2006, however, that I found myself at another large technology company looking to rediscover itself. In the summer of 2006, I was one of a relatively small number of product leaders to tour a draft of a new initiative at eBay called “eBay 3.0”. Led by the marketing team, a small, strong team had done a lot of research on what made eBay different, and what people wanted from the eBay brand. The answer was that eBay was fun, full of serendipity, emotion, thrill. The competition of auctions, the surprise at discovering something you didn’t know existed. This reduced into a strong pitch for eBay as “colorful commerce”. I was excited about the research and the work, because it echoed some of the things I remembered about Steve & Apple, and the simple vision he had for a company that made products that people lusted for. But I also remember voicing a strong concern to several members of the team. I told them about Steve’s speech to the Rhapsody team, and asked: “Does eBay want BMW market share, or Toyota market share?” At the time, eBay was more than 20% of all e-commerce, and all plans oriented towards growing that market share. Unfortunately, eBay tried to do both with the same product. It’s not typical for a large, successful public company to basically say market share doesn’t matter, and to drive a company purely around a simple focus and vision. When things are the toughest, unfortunately, that’s when leadership and vision matter the most. Who would have imagined that Apple would have the largest market capitalization in the world? Who would have thought that in the year 2011 that Apple – not Microsoft, not Dell, not Sony – would be defining the market for so many digital devices and services? Most importantly, who would have thought that a leadership mandate that eschewed market share would achieve such dramatic gains? Apple so easily could have gone the way of SGI, the way of Sun. Instead, it literally shapes the future of the industry. All because in 1997 Steve was able to offer a simple and compelling reason for Apple to exist. A purpose. And it’s a purpose that managed to aggregate some of the most talented people in the world to do some of their best work. Again and again. So I will add here a simple thank you to Steve Jobs for that meeting, and for changing the way that I think about every company’s purpose – their reason to exist. Rest in Peace, Steve. It has been quite a long time since I posted here about eBay. I still use the site regularly (I typically still list at least a few things every month), and while I may tweet about things from time to time, I rarely feel the need for a full blog post. What’s the big deal, right? So what if Ikai found a better deal on Amazon for his Star Trek geekfest? The issue here isn’t that I was somewhat obnoxious (although clearly, I was a bit obnoxious). Ikai & I worked together at LinkedIn, so it’s not unexpected to have a little bit of fun with the back & forth on Twitter. The problem is that Ikai is a smart, technical guy. He’s also someone who looks for a good deal. 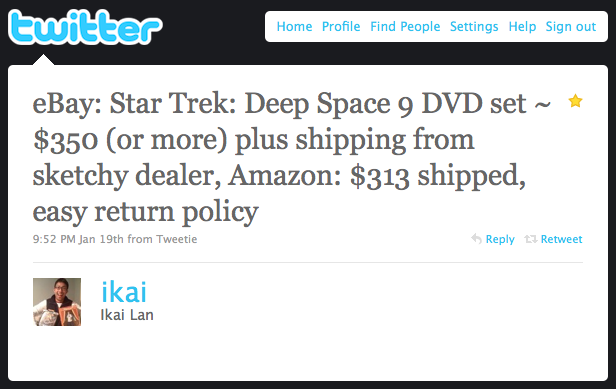 If someone like Ikai thinks that Amazon has a cheaper price on an item like the complete DVD collection for Star Trek DS9, then eBay has a real problem. When I wrote my Eulogy for eBay Express in 2008, I talked about four key value propositions that eBay navigates: value, selection, trust and convenience. One of the motivating factors behind eBay Express was trying to find a way to leverage eBay’s huge advantages in value and selection, while shoring up perceived weaknesses in trust and convenience. 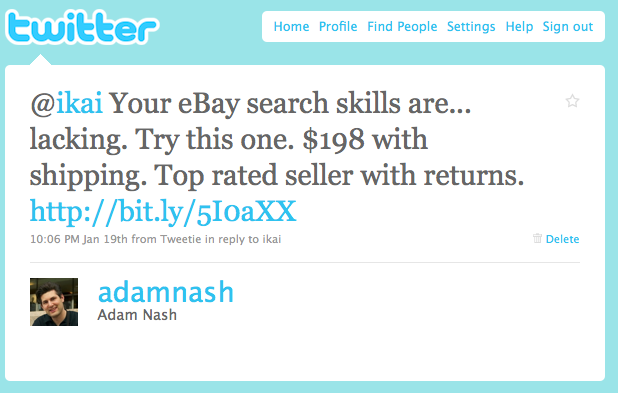 But here we are in 2010, and while eBay has the item, apples-to-apples, for over $100 less than Amazon.com – Ikai didn’t know it. And you know what? If a low price falls in the forest and no one is around to hear it, it doesn’t make a sound… or a sale. The point is, despite the fact that Ikai is an engineer working at Google, he couldn’t find the item. So a $115 price advantage was nullified. Why? I’m not a 100% sure what Ikai did to identify the proposed “$350 price”. When I searched on eBay, I found literally dozens of items priced below $300, many of which were from top sellers, and many of which that offered returns. In fact, I saw items as low as $130, but I tried to find the lowest priced item that matched the quality of service Ikai would expect from an Amazon third party seller. Of course, I’ve been on eBay since 1998, and I spent years working on structured data and search products at eBay, so I have a hunch why I found the items and he didn’t. He typed the wrong query. My guess is that he typed something like this “Star Trek DS9 season 1-7” in the DVD category. Makes sense, right? Unfortunately, this only returns two items, the cheapest of which is $299. Despite years of investment, the eBay search engine still doesn’t understand that “DS9 = Deep Space Nine”, and that “1-7” is a range, and that “season” is an attribute that DVD sets for television series can have. The () notation is how the eBay search engine does OR. So I was able to find listings with both “nine” and “9” in them. To be fancy, I could have used “DS9” in there too, but it wasn’t necessary. Filter to DVD category to clean out other clutter. Sorting from high to low is a counter-intuitive trick, but if you assume that the collection will be more expensive than individual DVDs, it makes sense. I use this all the time with high priced items, since quality tends to float to the top. I then scanned down the list to find the cheapest collection sold by a credible seller (someone with high feedback and % satisfaction). And then I tweeted it to Ikai. Would anyone else know how to do this? Would anyone else want to do this? I do it, largely because I still love eBay, and because I actually know how to do it. Plus, I really appreciate saving money on items like this, so the $115 is worth a few minutes. But all I know is that if eBay can’t leverage it’s intrinsic price advantage with buyers like Ikai, then it has a serious problem. They can never beat Amazon or traditional retailer e-commerce sites on trust and convenience. They can, however, beat them on price and selection. But customers have to be able to find those advantages to value them. 2009 Platinum Eagles Sell Out: Speculation or Investment? This past week, the US Mint sold out of the one ounce 2009 Proof Platinum Eagle. 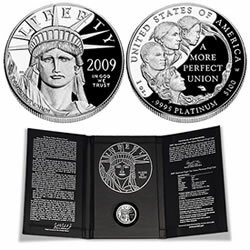 As no bullion coins or fractional sizes were minted this year, it was the only US Platinum coin produced in 2009. Released at Noon Eastern on Thursday, December 3, 2009, the Platinum Eagles were limited to a mintage of only 8,000. Over 7,200 of those sold in the first few days, even with a household order limit of 5 pieces in place. The US Mint sold just 4,769 of the one ounce proof coins during all of last year. Some had theorized that this year’s run would be challenged by the high price of the coin ($1792.00) and the relatively unpopular new design. However, given the huge demand for precious metals this year for investment (gold, silver, platinum, palladium), it’s hard to be completely surprised that this coin sold out so quickly. Nope. 2008 the US Mint only sold 4,769 coins. This year, they sell out early at 8000 coins. The relative price of platinum to gold is extremely low, given gold’s huge run up. A few years ago, platinum cost over 3x an equivalent amount of gold. At current prices, the two metals are approaching parity. Simple investment vehicles in Platinum and Palladium, like ETFs, do exist (they trade in London), but don’t have popular US versions (yet), so investment demand remains weak compared to it’s ETF-rich brethren of gold (GLD) and silver (SLV). The automotive industry, which is the largest consumer of platinum and palladium, is extremely depressed. However, since the demand for fuel efficient cars is growing, the use of these metals in catalytic converters and fuel cells seems to forecast significant future demand when the industry recovers. That being said, I was surprised when I searched eBay for completed listings for the 2009 Platinum Eagle. Normally, when there is a sell out at the US Mint, you immediately see panic buying on eBay for huge premiums over the US Mint price. Here is the query. What you see is that, as of December 12, the prices range from $1727 to $2050, hardly a premium given the transaction costs of eBay / PayPal which can easily run 8-9%. Was the sell out the product of true individual demand for the coin? Or was this a case of coin dealers speculating on a sell out and premium collectible opportunity? The problem with the Platinum Eagle series is that it’s unclear how many collectors actually try to build “the complete set” of these expensive coins. Set building is typically the primary driver for premium values for the silver and gold eagle series. I’ll be watching the completed auctions closely this coming week. There are a couple sellers already experimenting with higher prices. Let’s see if they stick. It’s been quite a while since my last eBay-related post, and nine months since my high traffic post, A Eulogy for eBay Express. However, this past week Keith Rabois wrote a fairly inflammatory article for TechCrunch that I thought was worth discussing. Keith is currently an executive at Slide, and was formerly a founder at LinkedIn and an executive at PayPal, so his consumer internet credentials are fairly substantial. Told you it was inflammatory. However, I’m not normally the one to take eBay flame bait. After all, if I was, I’d be posting twelve times a day on the topic. But Keith actually hit upon a deeper insight in his piece that is worth calling out, because it provides insight into both eBay and other successful, engaging web products. Although it was always classified as an e-commerce destination, the quirkiness of the eBay marketplace was once a major source of entertainment on the Web. It was where people sought and bought everything from the first broken laser pointer to Beanie Babies to Bob Dylan’s boyhood home. While the catch—anything from an antique clock to a Gulfstream II—was rewarding for the buyer, it was generally the entertainment and excitement of the chase that brought a buyer to eBay in the first place. This insight, that eBay’s success was driven by entertainment and engagement is extremely strong. In January 2004, over 47% of internet users visited eBay once per month. In 2007 Facebook & Youtube added to this drift of attention and engagement (timeline is off here a bit, since Youtube took off well before 2007). eBay stripped out the fun, not pursuing eBay 3.0 strongly enough, and then Donahoe pushed towards an Amazon-focused approach. Fun gone. I don’t personally agree with much of the deductive flow here, actually. Overall, Myspace, Youtube & Facebook have significantly increased the engagement overall on the internet, taking metrics like “daily visits” and “daily unique users” and “time on site” to previously unthinkable numbers. It isn’t a zero-sum game, per se, because the overall number of users and time spent on consumer internet sites has grown dramatically. More importantly, the assessment of eBay 3.0 and the current strategy makes it sound like eBay’s current approach is largely management-driven, when in reality the overwhelming global scale and activity of eBay buyers (and sellers) has made the current direction almost fait accompli. In 2006, the number of eBay listings that were fixed price (including store listings) was already well north of 50% and rising rapidly. The marketplace was voting through billions of bids, BINs and listings, and it was voting for a higher and higher proportion of fixed price commerce. But I digress. The point is that Keith got something very, very right in his article about eBay. eBay was never meant to be just e-commerce. It was fun. It was exciting. It was empowering. There are a couple strong reasons for this. First, if you’ve read my previous posts on game mechanics in the design of engaging software and websites, you’ll know I’m a big fan of Amy Jo Kim‘s work here. In fact, eBay demonstrates all five of the “fundamental games” that humans like to play. This wasn’t done intentionally, but it explains a lot of the almost visceral, addictive reaction that people had to eBay. Second, eBay captured irrational economic behavior on both the buyer and seller side of the marketplace brilliantly. Buyers exhibited a number of irrational behaviors that we now describe and associate with behavioral finance. These irrational behaviors on the buyer side, combined with the game mechanics of the site, effectively created a lift in demand. Combined with the transparency and breadth of the online marketplace, you had literally a huge multiplier on e-commerce demand. On the seller side, however, engagement was driving irrational behavior too. Buyers of collectibles became sellers in order to “fund their habits”. (I know this personally, since I began selling coins on the site to help keep my PayPal “slush fund” fully tanked so I could buy coins…) More than anything, people fell in love with the empowerment eBay offered. You didn’t have to have $100,000 to open a business, an SBA loan, or an MBA. The web was full of stories of people just driving around garage sales, picking up items on clearance at local department stores, and stocking up at flea markets. Some of these sellers grew businesses that measured in millions of dollars, promoting hope that anyone could build a business on eBay. Of course, there was a kernel of truth to this. An unprecedented number of successful businesses were built over eBay. But most sellers were nowhere near any sort of traditional business scale. There is a reason, after all, that PowerSeller starts at just $1000 a month. And that’s $1000 of sales revenue, not profits. Can you imagine any real-world storefront with only $12,000 a year in sales? People would spend 8, 10, even 12-hours a day looking for inventory, listing items, answering questions, and shipping goods. When people went to the first eBay Live, they even made sure that on the road trip out to California, they brought enough packing materials to keep shipping items. They made buyers happy because it wasn’t just a business for them, it was a way of life. I didn’t get to go to the first eBay Live in 2002, but I did go to three starting with the third in New Orleans in 2004. I’ll never forget, at one point Pierre was touring the booths (I believe he was giving a speech that day). A group of us were discussing how to manage the insanity of the event – the intensity and sometimes aggression of some attendees who had to have every pin, every collectible. I won’t get the quote right, but Pierre said something there that has stayed with me to this day. To paraphrase, he said that he loved the energy, and that the insanity is part of what made eBay great. If eBay became just another sales channel, then it would lose its magic. It has been five years, and for me personally the growth in my understanding of game mechanics, behavioral finance, and web 2.0 product design have given me terms and tools to help explain the irrational engagement that people had with eBay, and currently have with sites like Facebook, LinkedIn & Twitter. eBay has a very metrics-driven culture, but while site and business metrics accurately reported the results of the incredibly engagement and activity on eBay, as always they never actually provided the full picture around causality. Instead, eBay fell victim to a much more insidious threat than simple competition for eyeballs or time on site. It fell victim to a version of the Innovator’s Dilemma. There is a limit to how many people will wrap their lives around selling on eBay. There is a limit to what percent of people’s purchases they will pursue through an auction process. There is a limit to the disposable income to spend on collectibles and hard-to-find items – most purchases, in fact, are of new, standard commodity products. Thus the company and the site follows the aggregated votes of hundreds of millions of buyers and millions of sellers, their “best customers”, and those votes are eventually dominated by the bulk of the e-commerce market. Asked about eBay’s identity, Mr. Donahoe said he wants shopping on the site to offer the same sort of low-price experience as buying at bulk retailer Costco Wholesale Corp. There, “the inventory is somewhat fluid, but everything they’ve got is a great deal,” he says in an interview. eBay 2009 cannot go back to the eBay of 1999, or even 2004. The size and scale and make-up of the market means that any attempt to “crowd-out” the less engaging aspects of the market would mean drastically reducing the size of eBay. That doesn’t mean there isn’t hope. There is still time for eBay to re-invigorate its experience to capture and create elements that drive engagement. There is time to learn from both the past and the present, and chart a course that will inspire and empower millions. The original needs that drove eBay to success still exist. People are finding some of the serendipity and empowerment from Craigslist… but it’s not as actionable or broad. The game mechanics, for the most part, aren’t there. Amazon has increased its breadth, but it’s truly an ecosystem designed for large sellers (by eBay standards). Google has enabled independent websites to purchase traffic… to an extent. But the more you make selling online like running a business, the more you lose that sense that this is fun instead of work. Collectors still want to collect. People still want to find ways to make a little extra money and to be a part of something bigger. Little kids still collect and trade things from a very young age – no matter if they are stickers, baseball cards, Pokemon, or whatever small colorful items come in sets with variable rarity. I sold my brother’s broken iPhone (he dropped it in the ocean) for $130 to a man on an island (Reunion) that I had never heard of. Those eBay stories still exist. Small businesses are still being built on eBay. Sellers are multi-channel, but eBay can and should offer them unique dynamics that capture a disproportionate amount of their attention, if not their business. Apple has a small fraction of the computer market, but it captures the lionshare of its attention. That could be eBay if it was prepared to act boldly and ask hard questions about what eBay reall should be… and shouldn’t be. eBay cannot be MySpace, Facebook, LinkedIn, YouTube, or Twitter. Nor should it be. Update (5/27/2009): Turns out I had missed a great post from Rob Go on this same topic, just a few days ago. Worth reading. A quick review of recently completed eBay auctions shows unmarked rolls selling for $30 to $50 each. Single pennies have sold for $2 to $4 each. Rolls with a Lincoln postage stamp and cancellation from the first day of issue at Hogdenville, Kentucky have sold for over $200. Most astoundingly, a single 2009-P Lincoln Cent graded NGC MS66RD and attributed “First Day of Issue” has sold for $400. View the current eBay auctions. It’s truly bizzare. $0.50 rolls of the new Lincoln pennies are going for $30-$50 on eBay. That’s insane. We’re talking about a coin that will be minted in the hundreds of millions, if not billions, this year. What I would love to do is to “short” these rolls – effectively presell them at this price, collect money now, and then send the rolls in a few months when you’ll be able to source them at less than $1/roll. Unfortunately, that violates eBay policy. It’s for good reason, since short selling actual inventory is hard to distinguish from a scam transaction. After all, how do you know the seller will make good on the future delivery? What is the recourse for the buyer? The lack of short selling, however, means that temporary supply/demand imbalances like this lead to effective price gouging for buyers who assume the eBay price is “fair”. It’s certainly fair for the moment, but the expected ROI on this purchase for the collector is likely to be disasterous. Still, I wouldn’t mind the ability to short sell a few hundred rolls. If you have access to a bank that actually has these rolls, you’d be a fool not to put them up on eBay quickly, before the prices settle down. Do I have any readers in Kentucky? If so, can you pick me up a box? It’s still fascinating to me how many insights I gain from the traffic to my own personal blog. Today, I checked my stats briefly and noticed something really strange: my post about eBay Express, A Eulogy for eBay Express, had jumped with a vengence to the number one post on the blog. My overall traffic spiked a bit too. A little strange for a post that is over 6 months old. You may recall an experiment eBay had called eBay Express where they tried to extend the brand with a different fixed-price site, but failed. Ex-eBayer, Adam Nash had a great eulogy and behind-the-scenes view of what happened that I recommend everyone read to see his perspective. OK, it’s hard not to find that last line flattering. Still, the branding point around the name “eBay Express” is fair, and as I mentioned previously, branding was one of the obvious mistakes made in retrospect. In any case, a little more snooping and I discovered that while eBay Strategies was the source of some of the new traffic, even more traffic was being sourced from the Seeking Alpha distribution of the article. I’ve been an active reader of Seeking Alpha as an investment site for years, and I’ve noticed their recent push for sourcing content from any major blogger. However, this is some real evidence that bloggers who leverage Seeking Alpha are likely seeing significant boosts in distribution. Interesting milestone this week. My very first patent granted. Ironically, I wouldn’t have known about it except for a promotion catalog I got in the mail today with a list of plaques I could buy to commemorate this patent from some souvenir company in Florida. Yes, I know. Weird. This was the first of several patent applications I submitted while at eBay. This particular application surrounded the logic and algorithm around assessing popularity for e-commerce listings based on “following” behavior, aka “Watch” in eBay terms. There is a lot I could comment on here about the USPTO, the dubious nature of software patents, the length of time, etc. Normally, I’d go on at length about some of these issues. Instead, however, I’ll just note that it’s a somewhat sentimental moment for me, because I always remember hearing about how my late grandfather had filed an important patent on his path to business success.